Originally posted on small business Saturday, I decided to share with you my 6 surprising benefits of shopping locally… some you may already know about but some you might never have even realised! Not only do small local businesses tend to use less packaging to keep their prices as low as they possible but plastic is used to protect and preserve products, which can make them cheaper to transport and last longer – and so cheaper for consumers. Local businesses don’t need to do that; most eateries bake/make fresh goods daily, greengrocers don’t package up their fresh vegetables and cafe’s reuse mugs/cups etc (just to name a few!). 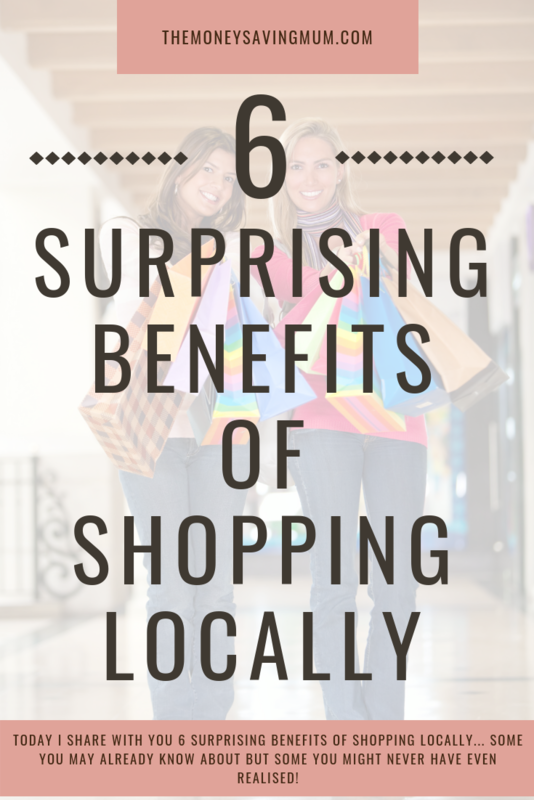 Shopping locally will support your community. Indirectly your money will be going back into the local economy when you shop and will keep local producers in business. If a business is busy & making money then chances are they will soon need to invest some of that money into staff. These jobs will be taken by people locally. I don’t tend to buy much fruit from supermarkets anymore and spend £6/week on fruit and veg locally instead. Last month I noticed my local greengrocers didn’t have any swede out on display. I asked the lady behind the counter and she said they weren’t in season. My first thought was ‘but Asda have them in year round’ and then it got me thinking. Why DO Asda have them in year round and HOW do they have them in year round if they’re not actually in season? Buying foods locally, for example from a greengrocers, will mean they stock what are actually in season; what are ready to eat. They won’t sell produce that has been preserved for months before from mass farming tactics or vegetables that aren’t as fresh or rather have the correct amount of vitamins in them that they should because they’ve been harvested a season too early. You cannot beat the personal touch of a local business owner who knows the area, knows you and knows the majority of their customers that come through the door by their first name. There are a lot of local businesses that support specific local charities. When you spend money in their stores you too maybe encouraged to pop your change in the charity box on the counter or notice a sponsor form for Dave to get his head shaved. So the next time you pass your nearest fruit shop, bakery or haberdashery make it your aim that the next time you need something you head straight there. If you got value from this post let me know & feel free to share with your friends! Next Post Why you should never pay to click and collect! It would be lovely to use small local shops but we don’t have any here in our town. Even the market has hardly any stalls. There is a butcher’s across the other side of town but I would have to drive there. There are no green grocers and no independent bakers. A few miles away is a cafe which sells artisan bread at a high price but I make my own cheaper. It is all supermarkets.